Cornwall Ontario – Toy and music enthusiasts now have a place to indulge with the opening of BACK SPUN, one of Cornwall’s newest retail stores. 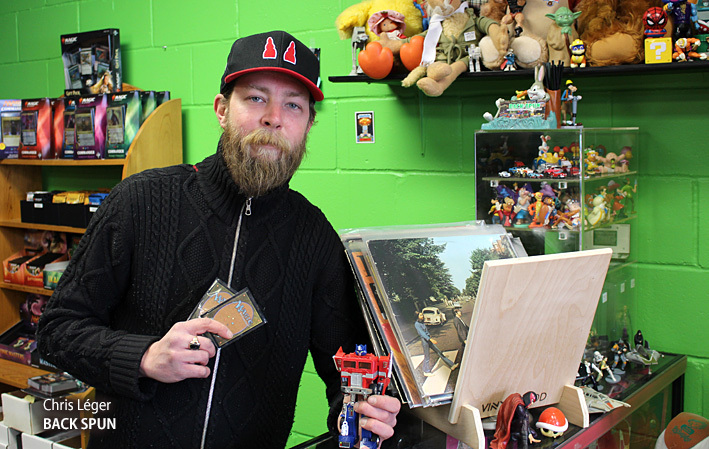 Chris Léger, also known in Cornwall and area as ‘The Vintage Toy Man’, has been a staple vendor at comic book conventions across Ontario and Quebec for the past six years. He has amassed a considerable collection over the past 25 years, and with that in tow he has hit home with a brick and mortar shop on Pitt Street North – BACK SPUN Records, Gaming, Collectables and More. BACK SPUN offers a wide array of products and services including new and vintage toys, vinyl records, clothing and equipment. Popular culture is well represented with toys ranging from GI Joe to Sesame Street, from the Six Million Dollar Man to the Avengers, from Star Trek to Star Wars. They also offer a large selection of Magic the Gathering cards, available in boxes, booster packs and singles. The retail space will play host to tournaments and Friday Night Magic, offering local gamers a comfortable environment to meet, compete and socialize. With a laid back philosophy, BACK SPUN has been creating a relaxed environment with new and vintage vinyl, creating a great atmosphere and chill vibe. Gamers compete and vinyl enthusiasts dig through crates as children of all ages play with toys, as they reminisce of the simpler days, all to the warm analog tunes and tones.